Reverse Osmosis (RO) drinking water systems provide high-quality water for worry-free drinking and cooking. This state-of-the-art filter will improve the quality of water from both private wells and municipal water supplies. With more than a century of trusted experience in water treatment solutions, Elkay provides customers with safe, professionally-treated drinking water aimed to suit every possible household need. 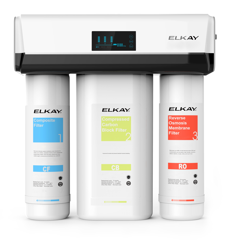 Clean water is sustainably available through the use of Elkay’s products with innovative water purification technology, high efficiency and outstanding product quality. Choose from a wide array of indoor and outdoor drinking fountains in a variety of styles and finishes, including many ADA compliant models. Elkay drinking fountains meet Federal and State low-lead requirements; have Flexi-Gaurd safety bubbler featuring contemporary styling and a special anti-microbial agent that is infused into the bubbler. Established in 1920 Chicago, USA, with the vision of creating the highest quality products and the best service, Elkay continues to grow and lead the market with products, And new technology. Vision and goals over a hundred years ago are maintained and promoted through three generations of Elkay's family - today with more than 3,500 employees, a global reach. Elkay products are superior in design, technology, quality compared to other products on the market. 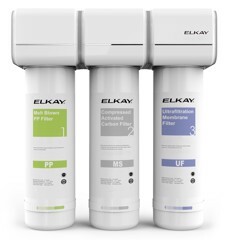 Elkay's water filtration solution not only ensures the best water supply, but also offers advanced features, easy-to-follow machine status monitoring, and convenient replacement for the best quality of life. , Ensure the health of the whole family.